Priced to Sell Priced to sell. The impressive amenities this home has to offer includes: 6 bedrooms, 4 full baths, master suite has tiled walk-in shower for two; double sinks; whirlpool tub plus a walk-in and double closet, ceramic tile floors in all baths plus cultured marble countertops/sinks, custom cabinetry throughout, granite counters in kitchen, built-in buffet in kitchen plus 6.6x6.0 pass thru from kitchen to formal dining featuring built-in buffet, hutch, wine cabinet. French doors to dining, glass panel front door with double side lites and transom decorative glass window ceramic tile in kitchen with eating area and door to deck. 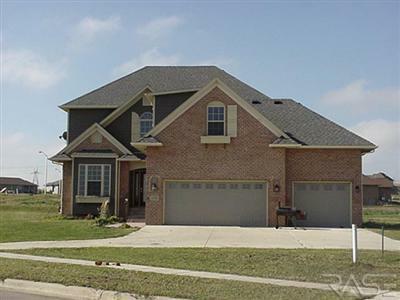 Hardwood flrs in LR, Grand entry with open staircase, 4 panel doors thru-out, engineered trusses, cellulose insulation, high eff furnace w/Aprilaire, LL finished family room is wired for projection screen TV and components!